Strength I: : the basic design situation that reduces the structure resistance and the magnitude of load. Service I: this design situation assumes for most cases the partial factors (load, resistance reduction) equal to 1.0. Extreme I: this design situation assumes for most cases the partial factors of resistance reduction equal to 1.0. The type of design situation is selected in the "Stage settings" frame. 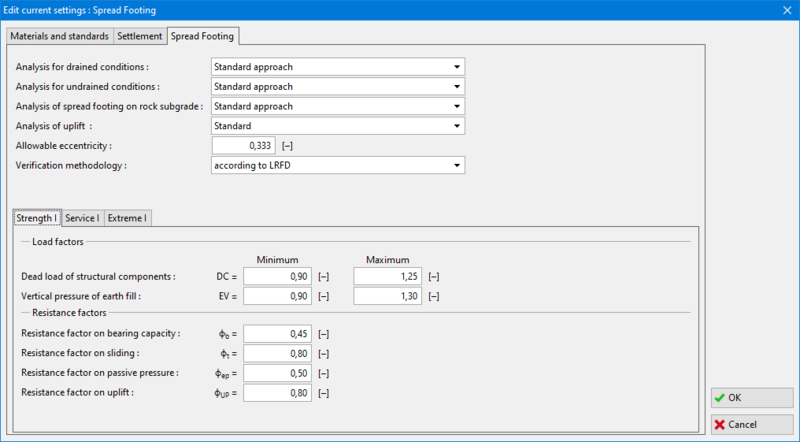 The values of partial factors (load, resistance reduction) can be modified in the "Settings" frame.